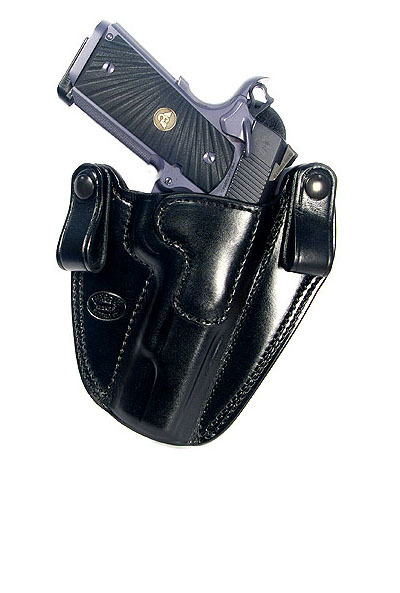 This Ritchie Leather Hideaway 1911 Holster is an inside the waistband leather holster, right handed, black, 1 1/2" belt loops. Designed for concealment and comfort. Fits Compact and Commander size non-railed 1911's only. A little history about me is I’ve been in Law Enforcement for eighteen years. Therefore I’ve carried a pistol concealed for eighteen years. In that time I’ve used many different brands of holsters and pistols. This holster is the most expensive holster I have ever bought. This holster is also the nicest finished holster. I’ve used a number of different inside the waistband holsters, what separates this holster from other inside the waistband holsters is it makes re holstering a pistol much easier then cheaper brand holsters. This holster uses leather loops which in my opinion is much more secure then spring steel clips other manufactures use. The belt loops on this holster being spaced further apart then Summer Special style holsters distributes the weight of a handgun much better. This holster is very comfortable but I have not worn it in a hot summer climate yet. I know kydex holster are popular these days but I am not a fan of them. If purchasing a cheaper holster I will normally buy Don Hume, Lobo, or Galco. This Ritchie holster is more expensive but it is finished much nicer and performs much better then cheaper brand holsters.